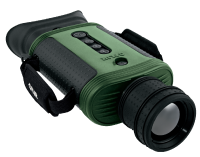 With the same image clarity and detail that knocked your socks off in FLIR’s Scout monocular cameras, FLIR’s new Scout Bi-Ocular Series gives outdoor enthusiasts even more choices and control in their thermal viewing experience. Featuring a full coverage eyepiece, inter-ocular adjustment, ergonomic comfort, straightforward controls, interchangeable quick disconnect lenses, and the unrivaled performance that only FLIR’s high resolution thermal cores can deliver, the Scout Bi-Ocular is a must have for any avid outdoor enthusiast. Keep track of your party, see animals, track game, and travel safely at night or in conditions with poor visibility. Your Scout Bi-Ocular isn’t just for out on the trail—there are dozens of on-the-water, on-the-go, or at-home uses. Employing either a 320 × 240 or 640 × 480 FLIR thermal imaging core with advanced image-processing algorithms, the high performance Scout Bi-Ocular allows you to see more and see farther than any other night vision technology. The BTS-X Pro model bi-ocular provides excellent long range viewing with sharp 320 × 240 native resolution in the viewfinder, and a 2× digital e-zoom step to 160 × 120. With the power of FLIR’s 640 × 480 core, the BTS-XR Pro delivers even greater range performance by supplying crisp, clear 320 × 240 native resolution in the viewfinder and in the 2x digital e-zoom mode, plus an additional 4× digital e-zoom step to 160 × 120. Full 640 × 480 resolution imagery in the BTS-XR Pro is accessible via aux video jack. Customize thermal capability for specific tasks by selecting from three available lens options – 35mm, 65mm, or 100mm extended range. Each of these high-performance thermal lenses allow rapid field exchange via an integral quick disconnect feature. The lenses are lightweight and easily focused, reducing arm strain during long viewing sessions. The ability to capture both photos and video is standard on all Scout Bi-Ocular models. One-touch recording frees up hands to focus and zoom during an exciting event to get the best video possible. A quick release hot-shoe literally makes access to AC power a “snap,” and a latched battery door provides fast and easy access to exchange or recondition batteries. Raised rubber sleeves and captive low-profile lens caps help protect your lens investment as well as providing excellent grip/sensitivity. If you are serious about the great outdoors, why limit your oppertunity to only the daylight hours? Experience nature in vivid detail 24/7 with the Scout Bi-Ocular.